Wanium is a Elegant Multi-Concept Theme with great attention to every details and incredible features. No tech skills needed. 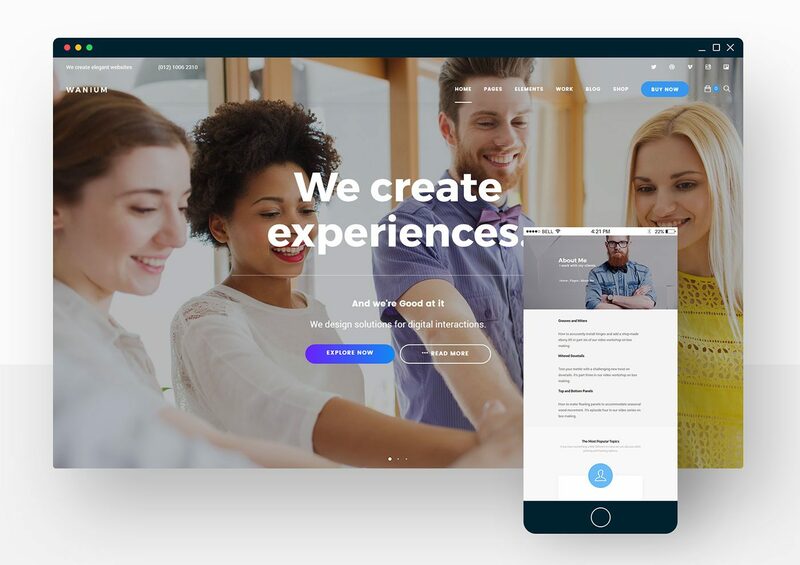 Whether the purpose you are launching a site, Wanium is everything You Need to Create Your Stunning Website. Visual Composer DRAG & DROP for WordPress Included for FREE! The demo images used on our demo sites are not included in the theme package and will be replaced by sample images. The client logo demo images are courtesy of graphicsfuel. Always giving the best with elegant styles. Take full control over your site. Build any layout you can imagine with intuitive drag and drop builder – no programming knowledge required. WooCommerce is now the most popular eCommerce platform on the web, so you can rest assured you’re in good company. You can customize the form and the mail contents flexibly with simple markup. The form supports Ajax-powered submitting, CAPTCHA, Akismet spam filtering and so on. Wanium includes a backend color picker in the theme options that allows you to easily change the color of any element throughout the entire webpage. This allows you to tweak theme settings live interface and customize the theme so it includes the colors, fonts, text — and pretty much anything else — you want. Wanium comes with 2 main layouts for your site, Full-Width or Boxed. These settings can not only be changed globally but in every page layouts. Still a hot technique in web design, this involves the background moving at a slower rate to the foreground when you scroll down the page. Add or change the header text/image/layout in Page Header view in each Page editor or global setting in live Customize panel. The browser-sized videos is using as the background for the web page, which allows you to change the visual experience in new and creative ways. This will automatically convert your existing menu or menus into a mega menu, support multi-columns layout with badge, description text and menu icons. Wanium comes with latest version of Google Web Fonts and 2 Icon fonts library: Themify & FontAwesome. The theme comes with .pot file and fully compatible with WPML plugin. This will help you to translate your theme into other languages. It means it looks and works the same on all devices, screens and browsers along with every version of these. The theme was built to search engine optimization, or the process of optimizing a website so that people can easily find it via search engines like Google. If you need any support, simply open a ticket in the Support Forums and our support team will help you in there. Theme Update is a free and instant informer to keep your website up-to-date with new functions and better performance. Wanium features should be so much more. It is Simple, Fast and Fun to build your site with our theme. Our promise to You! View all Live Demos here. Please remember, support is given through our Support Forums.